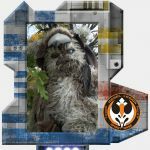 Rebel Legion :: View topic - Light, airy Ewok costume hints and tips for you! 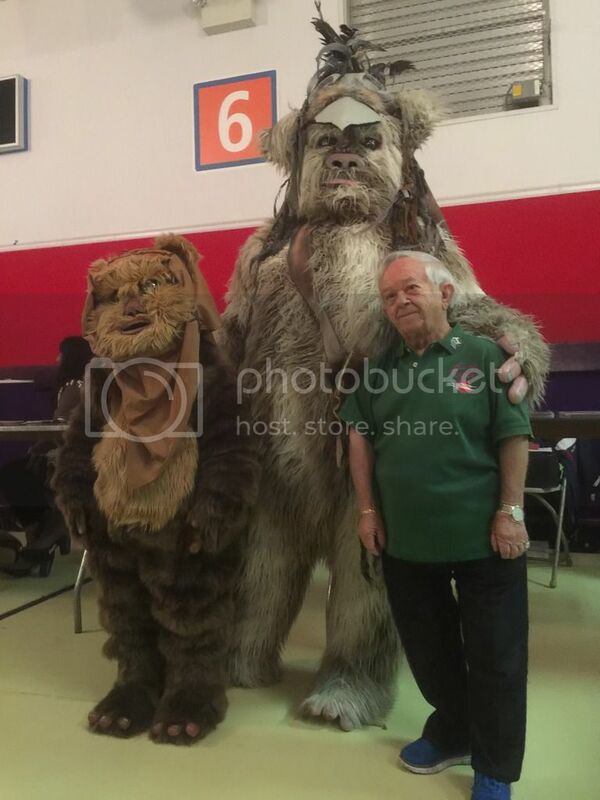 Posted: Fri Dec 09, 2016 6:59 pm Post subject: Light, airy Ewok costume hints and tips for you! 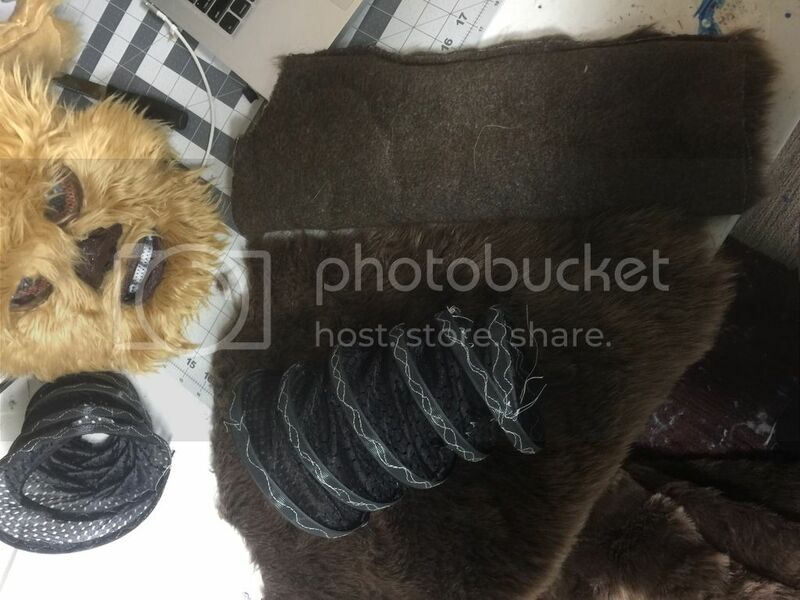 For all you Endor fuzzy critter fans out there I would like to present some building tips on Ewoks that will be lighter, airier, and fully washable for you and your fur-covered friends. I started off with an Ozark Trail (Walmart) blue camping mat. I believe this 1/2" thick foam is polystyrene. 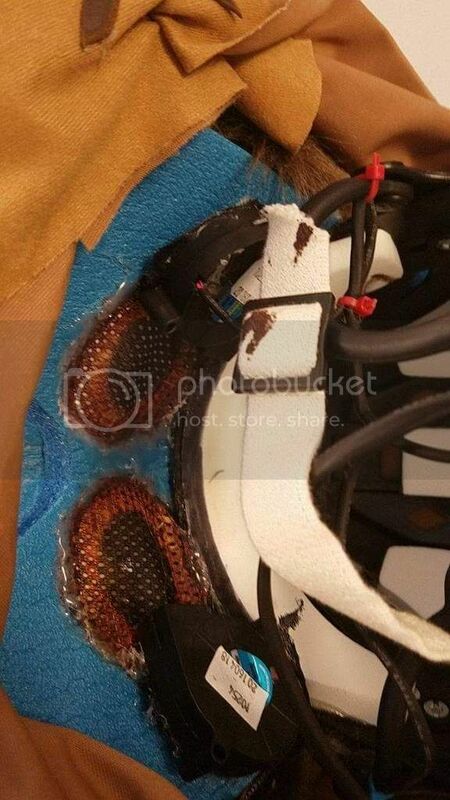 It bonds with hot glue. I made the face and hot glued clear half-dome Christmas ornaments into the face. Now the domes look way too large, and this is okay. We add cheek and eyebrows, which inset the eyes, just like we primates have in our facial structures. 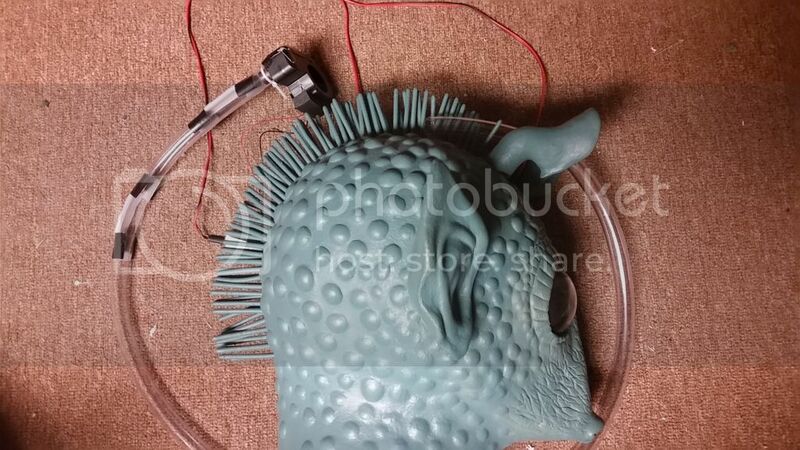 The nose cavity and mouth is also open. 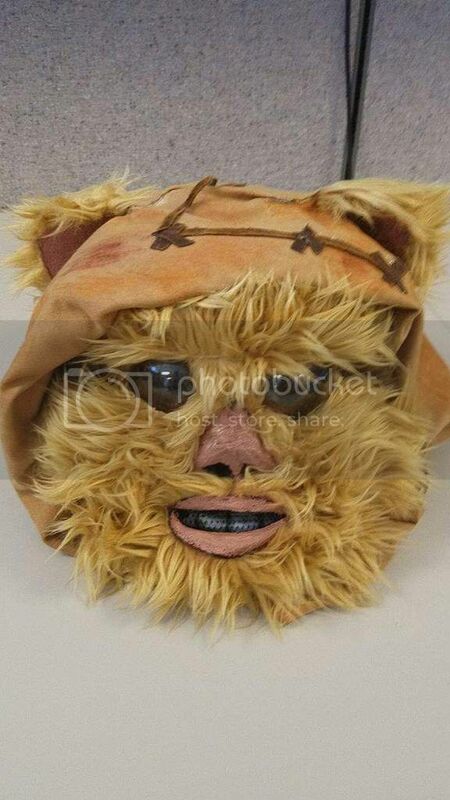 Thank you George Lucas for making these Ewoks with open mouths! Easier to breathe. I used a Mylec street hockey helmet as my base. It is light, size adjustable, and has ventilation holes built into it. Since a seven-year-old child will be wearing this, ventilation and comfort is key. You will also see the carved and painted nose and lips. These are also cut out of the camping mat foam and hot glued on. I use Tulip puffy fabric paint. 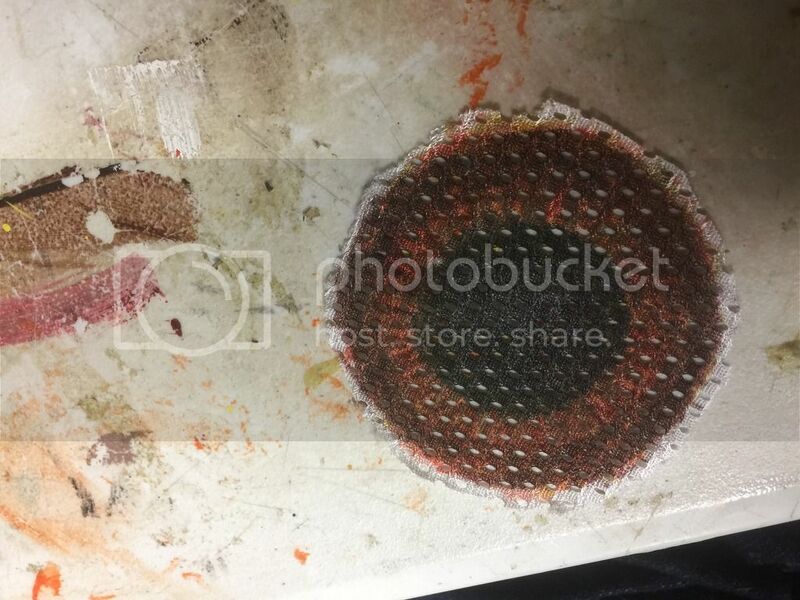 The foam has holes, so I push the paint into these holes and layer up the paint to get it to a decently smooth finish. I used purple, black, red, and some white to get the brown color. You will see later it gets lightened to better complement the body colors. 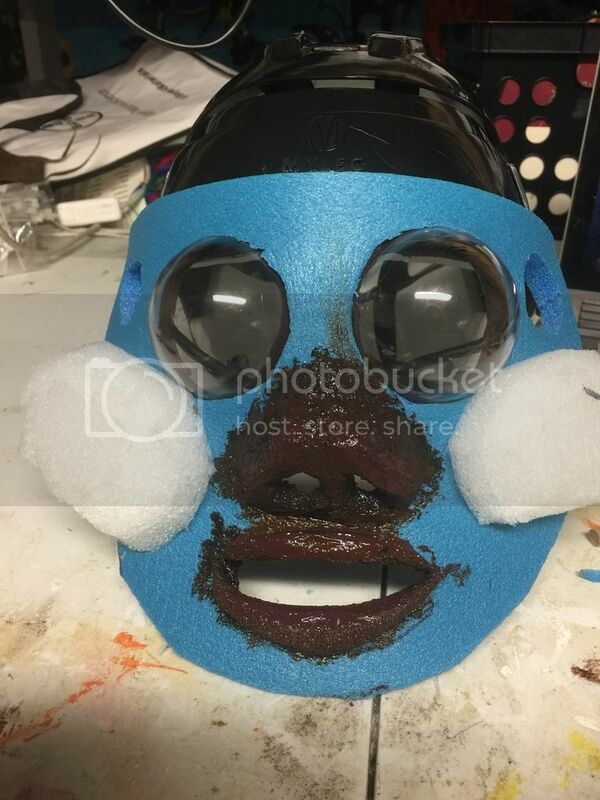 And I hot glued 1" thick cheekbones onto the face. Polystyrene, but you can use any kind of foam to achieve this effect. I did not have any cheesecloth on me, I would have used that for the eyes. The coloring is done with Sharpie marker on BOTH SIDES of the mesh. 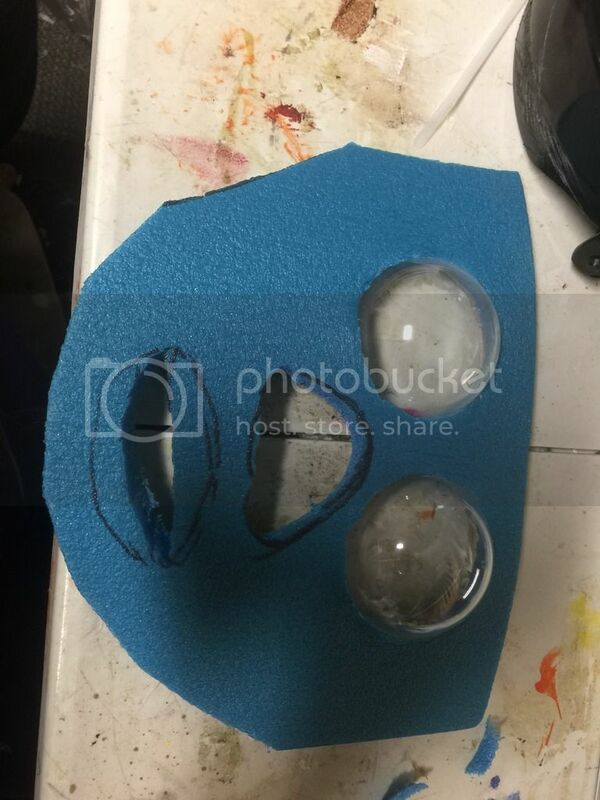 Make sure you leave about 1/4" of material around the iris so you can hot glue it onto the inside of the half-domes. Note the coloring as well - lighter browns near the pupil going to dark. This adds depth to the eyes. 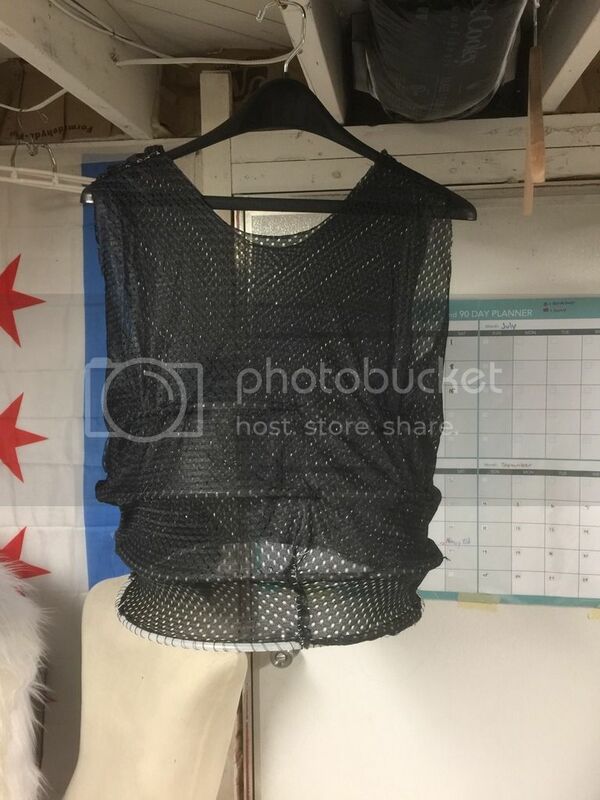 This costume is lined with the mesh you see on the right. It is very light, but if I had enough material I would have chosen the porthole mesh you see on the left. To figure out the sleeves I had a long sleeve shirt from the child as my measurement standard. 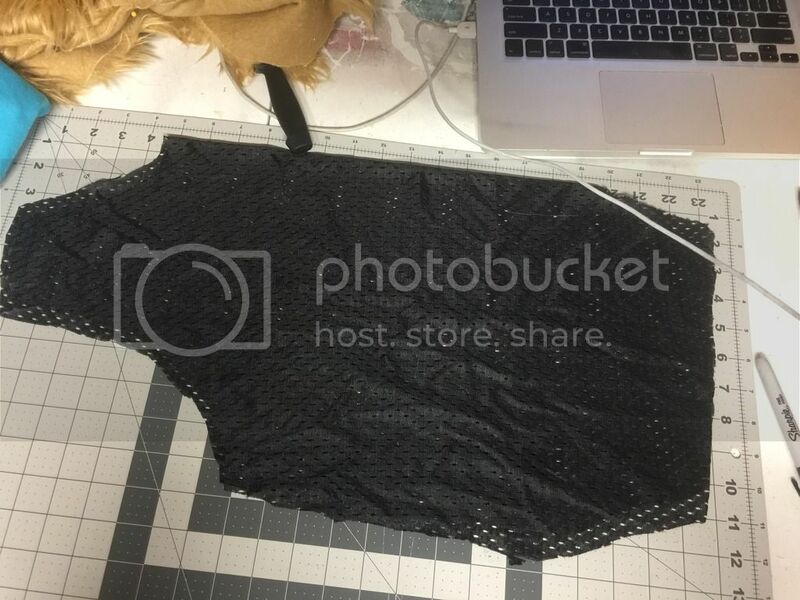 I folded the mesh material and traced the sleeve shape onto the mesh, noting that the sleeve unfolds into a full panel. This is also a good time to take the mesh sleeve and pattern out your fur sleeves! I add an inch or two of width to make this look smooth. Cutting tip! Use an exacto knife or boxcutter. 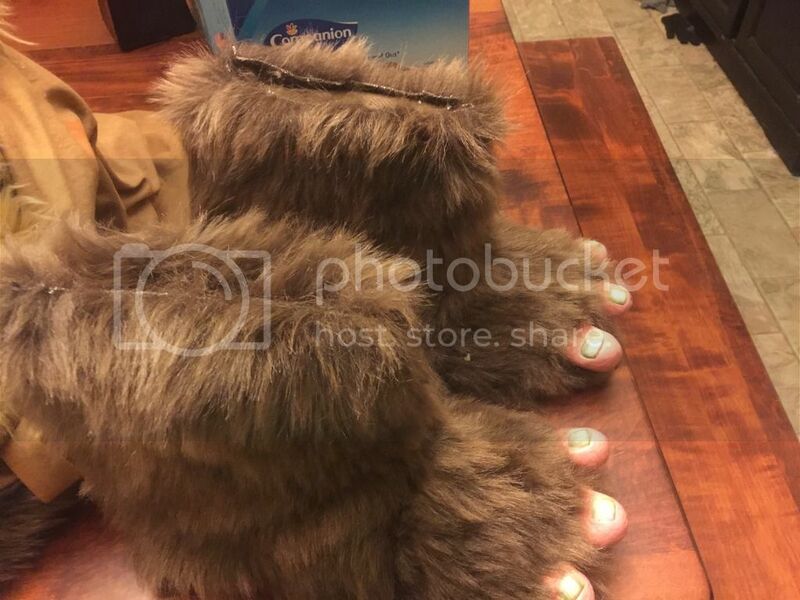 Cut on the hide, and avoid cutting the fur hairs. Rigilene! Here is the secret ingredient to fully padded arms (and if you so desire, legs). 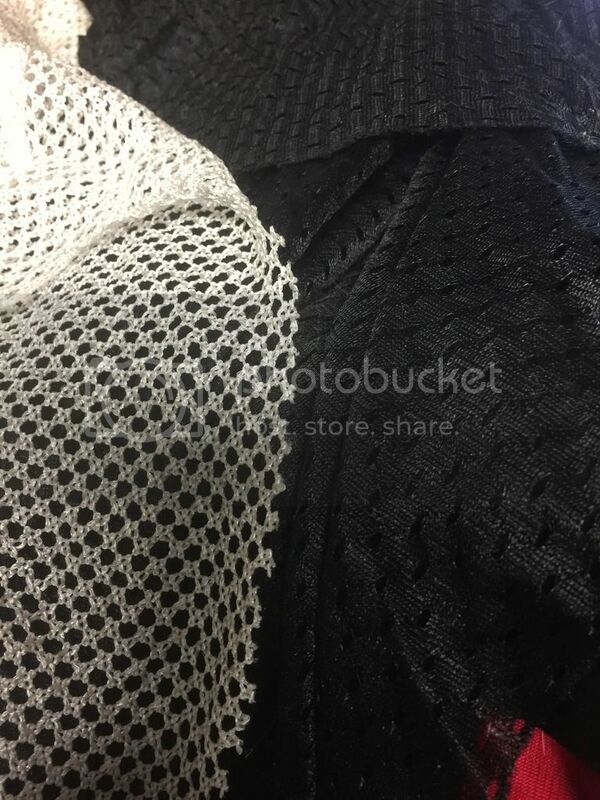 It is a horsehair braid trim used in boning. You can see 1/2" rigilene here, sewn in about 3-4" spirals on each sleeve. I wasn't being very careful here, it may help to pin down the rigilene so it does not stretch your mesh out too much. 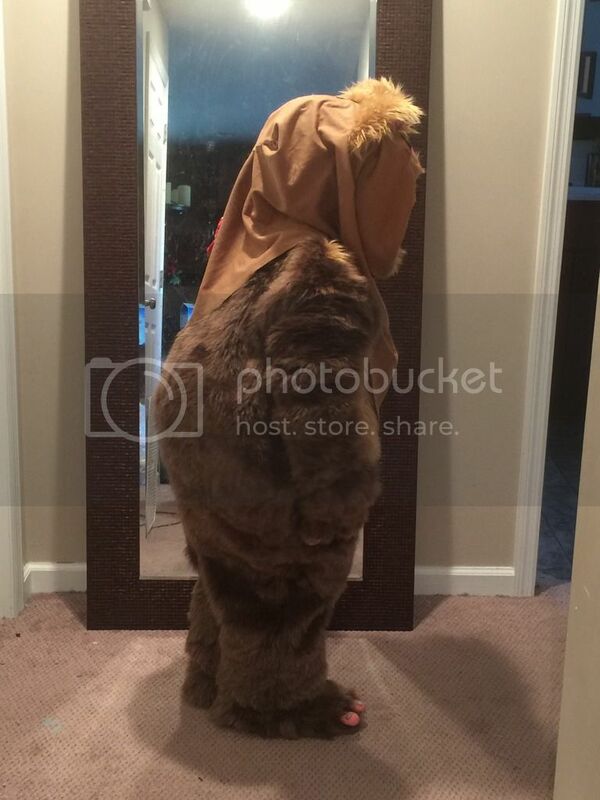 But this is the key to making your costume lightweight and looking solid. 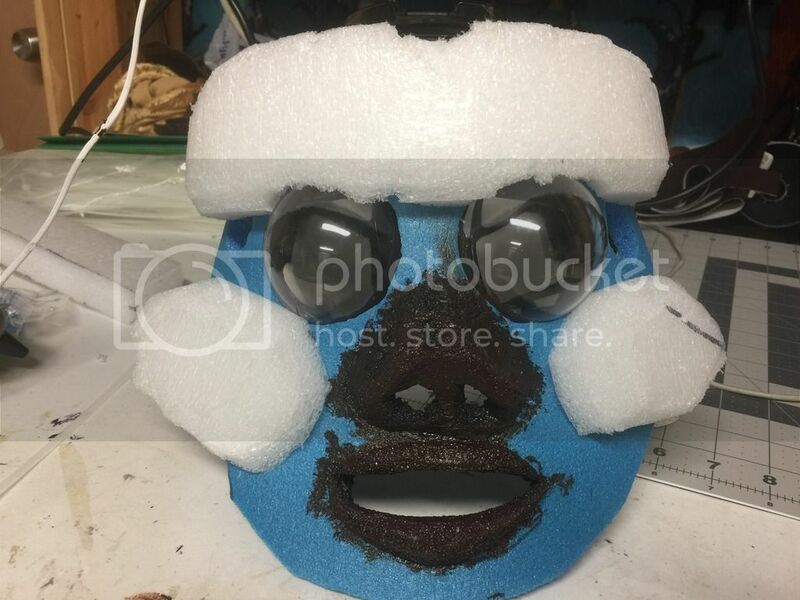 And the head got covered! Fur direction should flow from the nose, and radiate out like sunbeams. Fur direction on the body goes from the shoulder to the wrist, the shoulder to the toes. 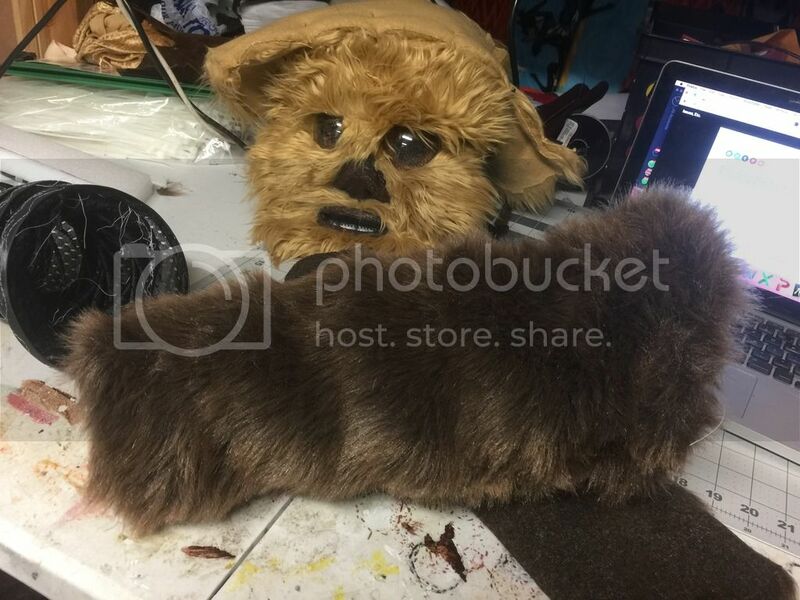 If you want your Ewok to look extra rugged change the direction on your body. It will look fluffier and more matted. You can also see the mesh I used to make the teeth. Since it is for a kid I am taking as many advantages as I can to make it airy. Otherwise you can use Friendly Plastic or Sculpey to make your chompers. 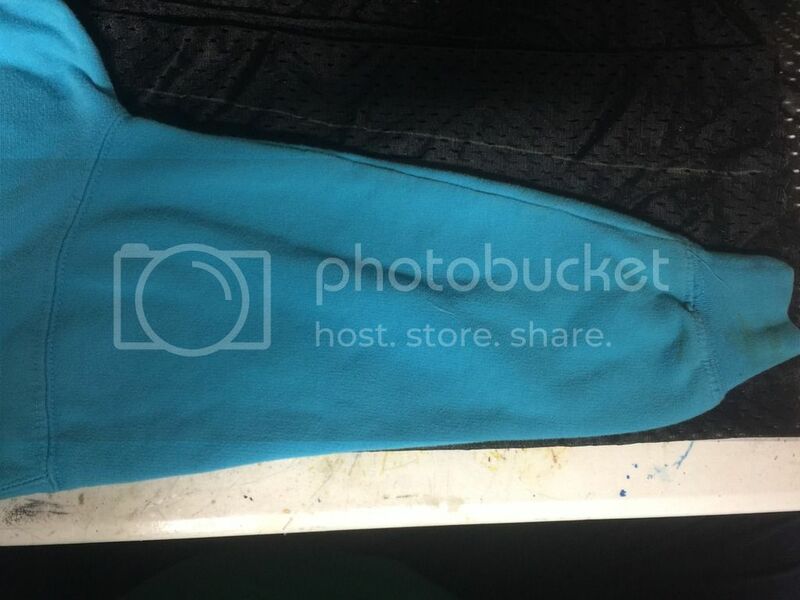 This is what the sleeve looks like on the inside. Pretty cool! And if you feel the need to still add padding you can add it on TOP of the rigilene lining. 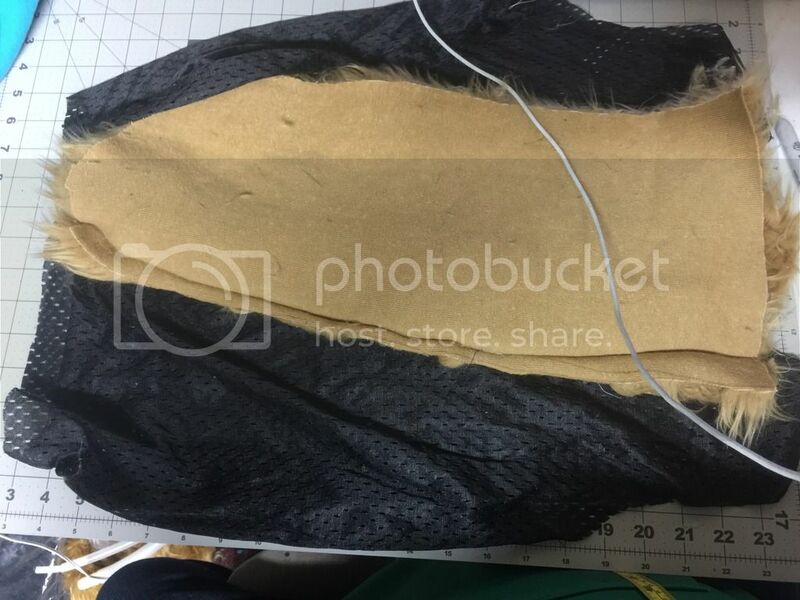 This is the belly pod lining. It is the length of the child's torso to about mid-thigh. I had the child lay down and marked it out, and then again used a comfortable sweatshirt as a measurement to make it ample in girth. Note the taper in the bottom of the belly pod, this is to give us that nice pear shape. The tan-colored belly was mapped out next. 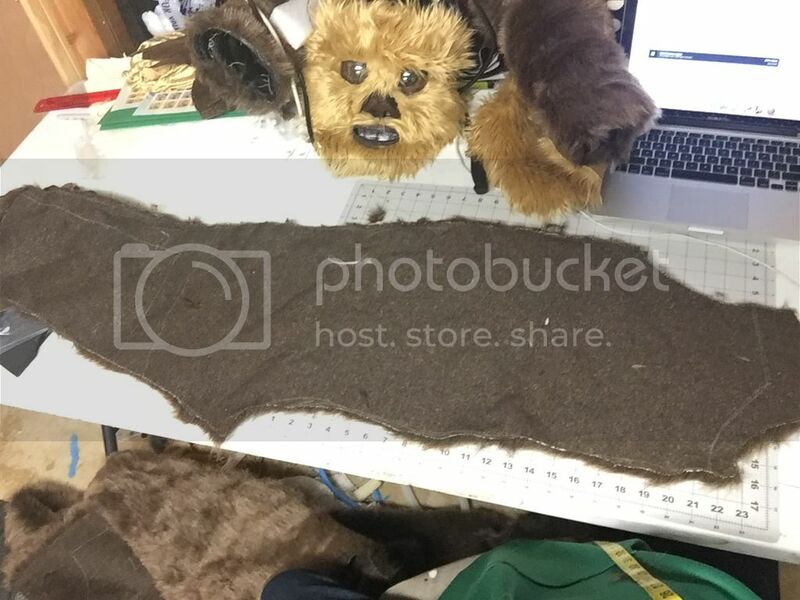 Since we will use the belly pod to help pattern out the body I traced where the tan fur will lie onto the lining. 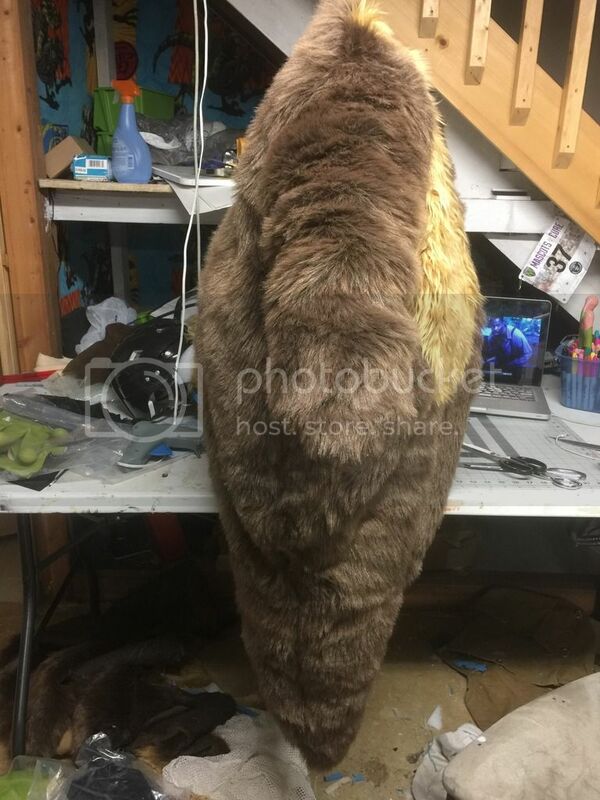 This is the quarter fur panel. It was determined by the belly pod and the pants of the child. Note how much lower the crotch is on the body. This is to accommodate the belly pod. 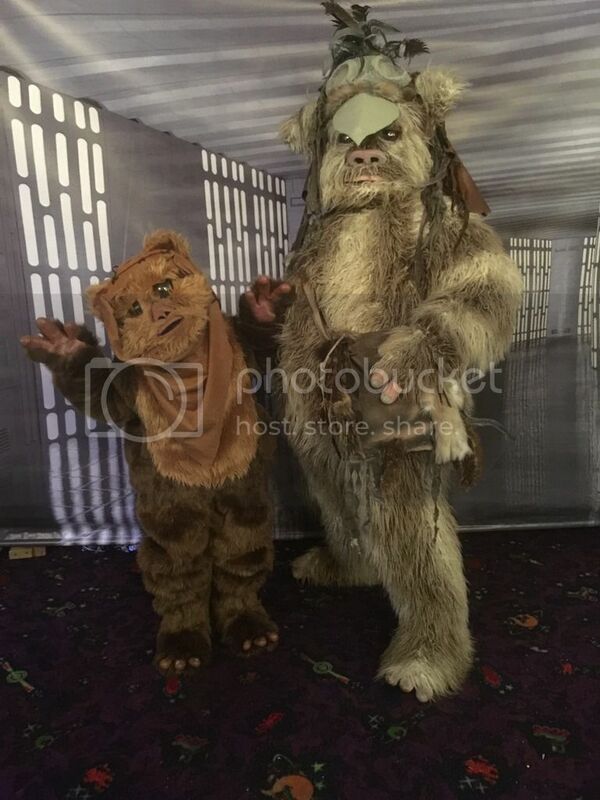 If your crotch is not low enough the Ewok will look pinched. Fingers and toes! I use a shoe leather paint because it has a nice flexibility to it. 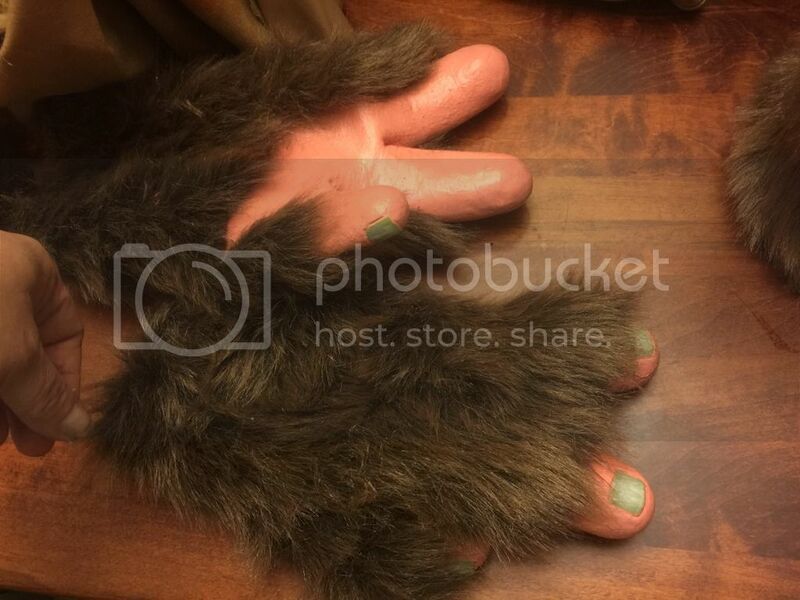 I eventually re-painted the hands by adding some brown puffy paint into the shoe leather paint. I also have a bottle of this paint in my costume crate to do last-minute touchups at troops. It WILL crack over time, but it creates a wrinkle effect on the hands and toes, so it is a good thing. 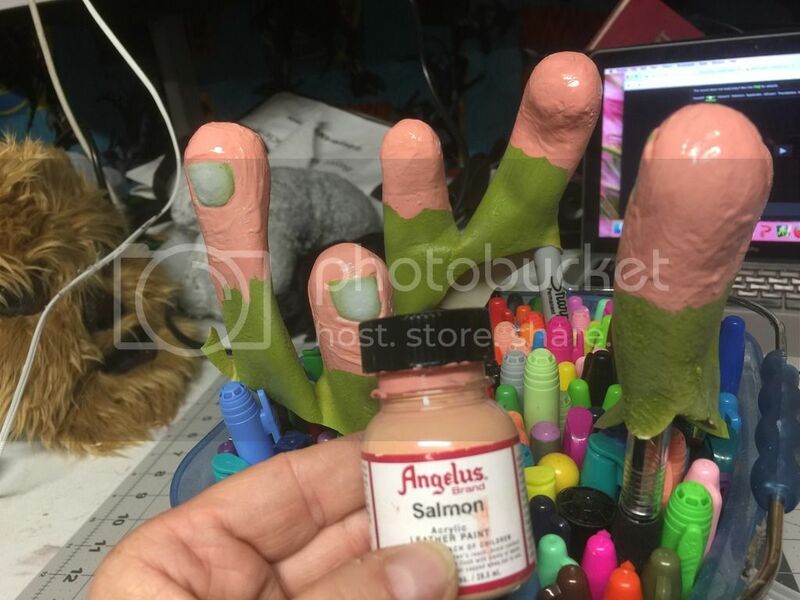 These are two pairs of latex hands of the cartoon character Shrek. Two fingers and a thumb, three toes!!! I use plumbing tubing, 1/2" thick, to create the padding of the belly. The two middle tubes are a little larger than the top and bottom tubes, there is about a 4" difference in length. The tubes are simply whip stitched into place. 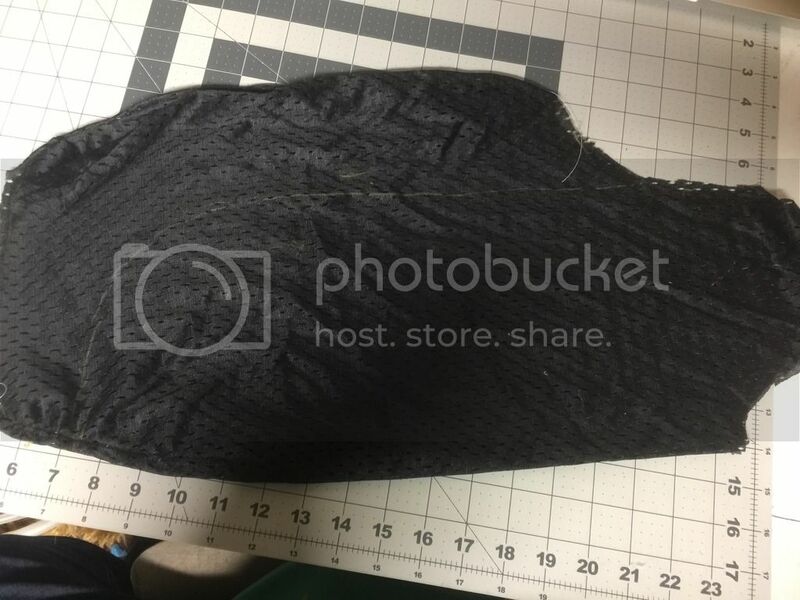 I just put a 1" thick velcro strip to connect the back. 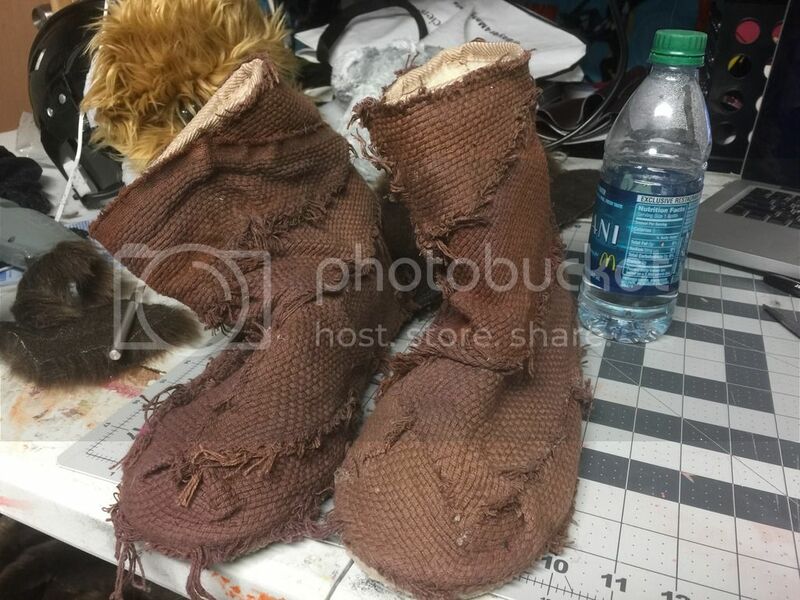 An extra pair of Jawa boots were sacrificed for the Ewok feet. 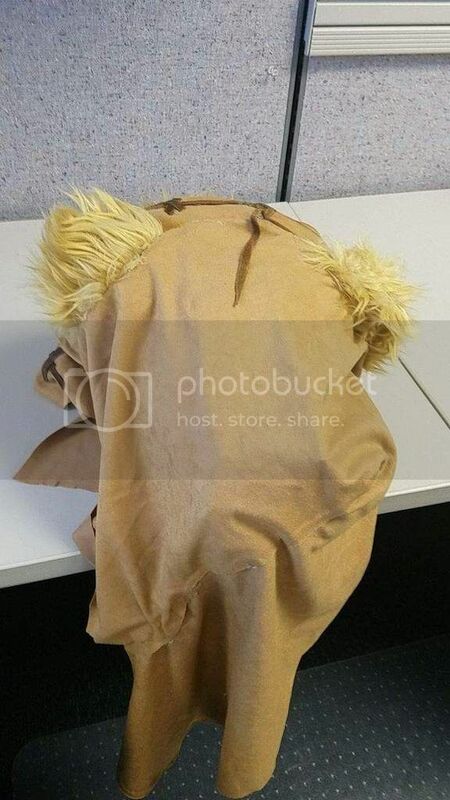 Hood and ears placed. Later we decided the ears were too large and too close together. * If I had enough time I would have taken the ultrasuede and lightly sprayed it with brown and black paint to make it look more weathered. 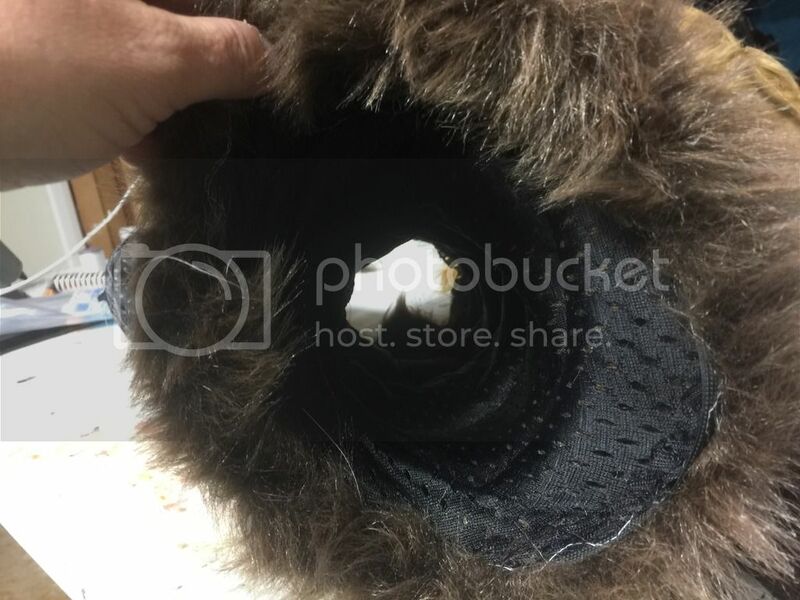 * To straighten out the rumples in the fur you can add fastek (plastic side buckle) clips to the insides of the sleeves and legs to the gloves and feet. But because this is for a kid we didn't take that extra step. * The eyes WILL fog up if there is not a fan system in the head. 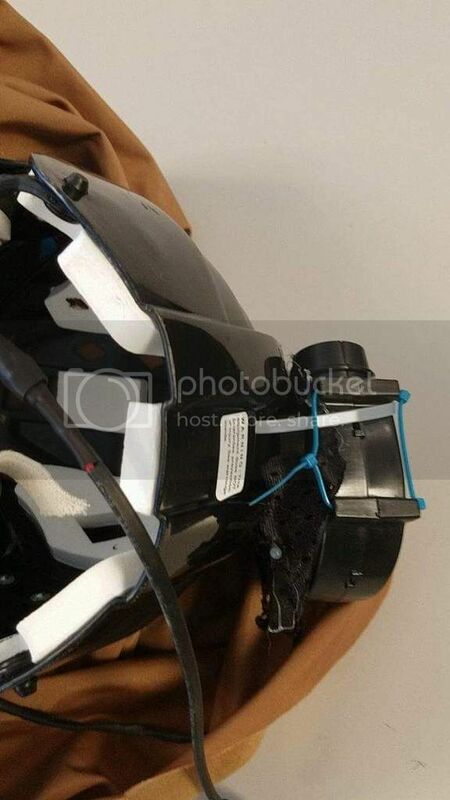 One of our Base members made a fan where two small squirrel cage fans blow directly into the eyes, and a larger one is connected to the back of the helmet, drawing humid air out and against the back of the wearer's shoulders. 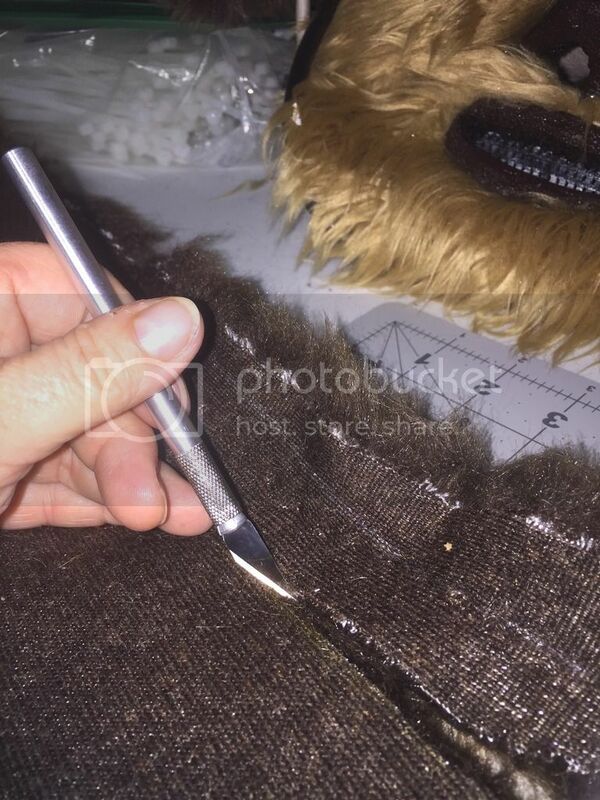 I will try to get a photo of the fan system because this is probably the most important piece of the costume. Would love to see the fan system! We need those for our desert climate. 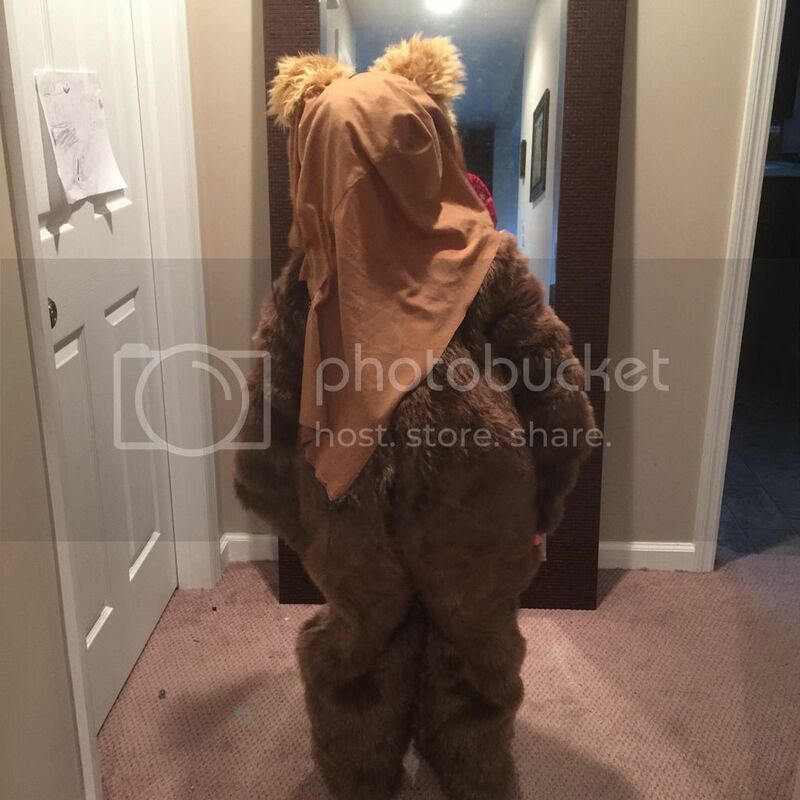 For my daughters ewok mask we created an airflow system which moves a monster amount of air within a mask. This is the same system Erin uses in her Logray ewok system. If you really want me to make you a system let me know, I do them to help people out and are completely customized to your particular costume needs. I don't have a general sales thread on any of the legions because I do this to HELP people...lol its not my day job. Such great information here. That tubing for the body is exactly what I'd like to do. This is great! 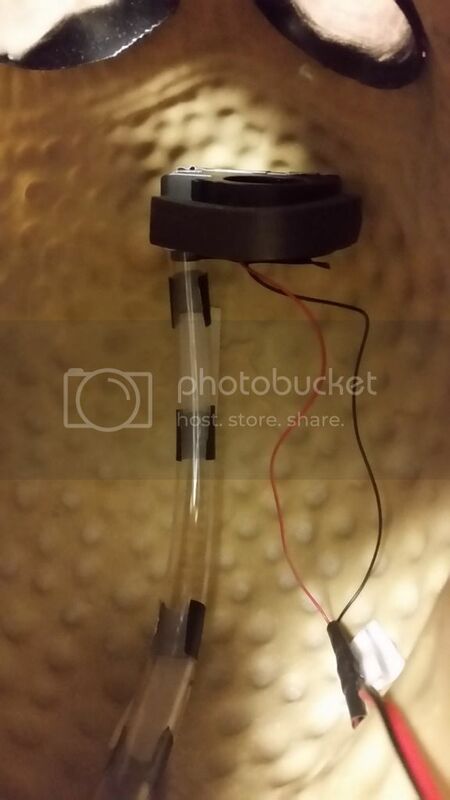 I'd be interested in ordering a fan if you're still able to make one. You can private message dbickel for the information on the fan systems. 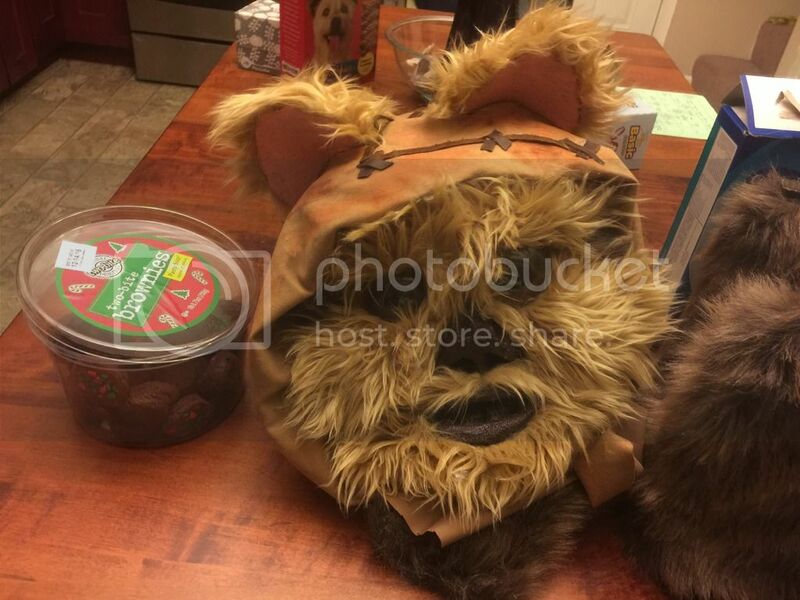 An Ewok is next on my list and this thread has been a really helpful starting point! 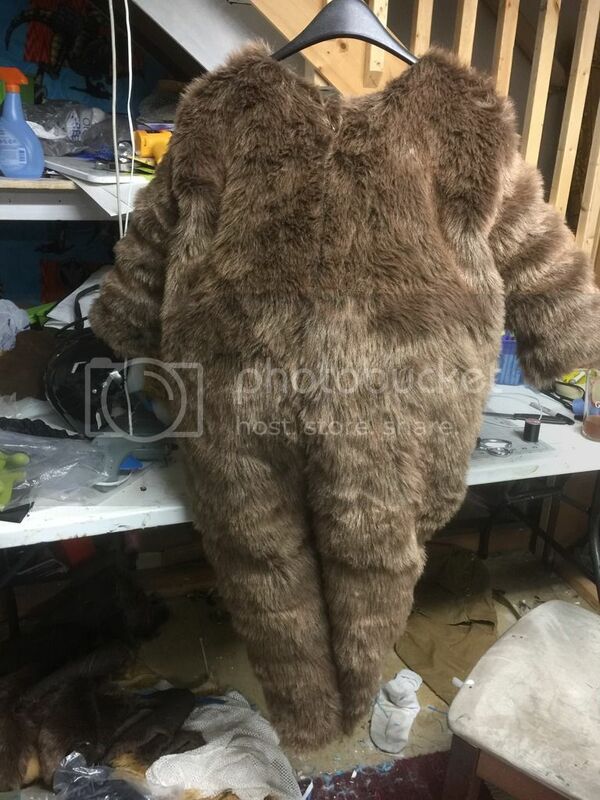 Any advice on faux fur yardage needed for a build? I'm 5'2"-ish, if that helps any. Five yards is plenty. If you choose to make the belly a different color then order a yard of the belly color. Normally the ear tufts have the same shade as the belly. Thank you! Faux fur is on the pricey side but I certainly wouldn't want to be short and not be able to get a match.